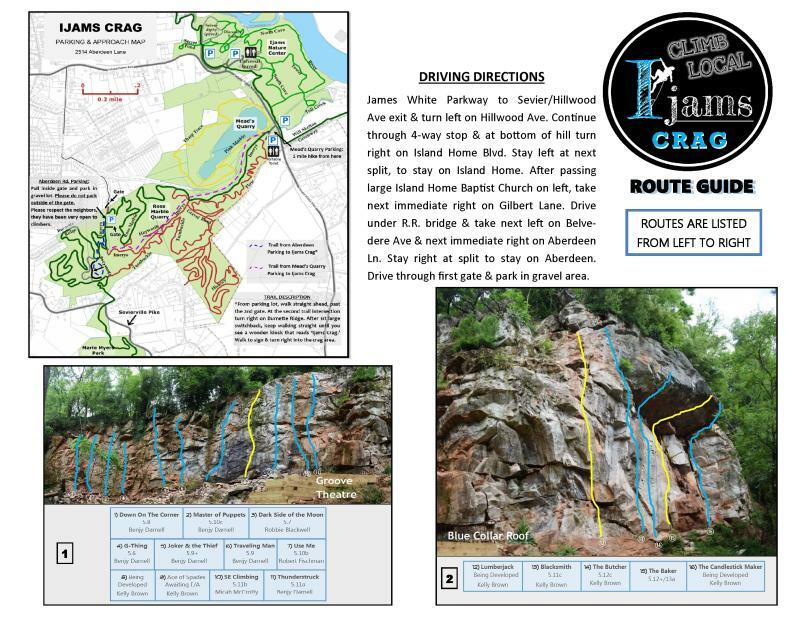 The Ijams Crag that offers 33 routes that range in height from 30 to 60 feet and from 5.6 to 5.13 in difficulty. This sport climbing area offers bolted routes with bolted anchors for beginners to experts, featuring a cliff line with moderate grades, solid rock, reliable access. Climbers should user their own gear to top-rope routes and only use fixed gear on anchors to lower off of routes. Located near the southwestern boundary of Ijams Nature Center, access to the Ijams Crag is from the Aberdeen Lane Trailhead. Directions: Take I-40 to James White Parkway and exit on Sevier/Hillwood Ave. Turn left then continue through 4-way stop. Turn right on Island Home Blvd and stay left at next split to stay on Island Home. Pass Island Home Baptist Church on left then take next right on Gilbert Lane. Drive under R.R. bridge & turn left on Belvedere Ave then right on Aberdeen Ln. Stay right at split to stay on Aberdeen. Drive through first gate & park in gravel area.